General. The 83 meter high belfry or hallstower (halletoren) is Bruges' most well-known landmark and its most symbolic civil monument. The tower's particular architecture makes it probably the most iconic in its kind. Belfries are typical for the region that used to be Flanders. They were an expression of the wealth, the independence and the strength of the medieval Flemish cities. You could say that they were the answer of the civil powers to the church towers built by the religious leaders. The city's treasury was in the tower, safeguarding the most important documents, being the town privileges. There are only belfries in Belgium, the north of France and one in the Netherlands (Sluis). 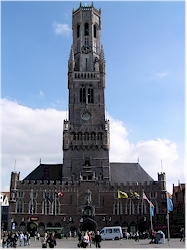 These belfries (including the one in Bruges) are inscribed in the Unesco heritage list. 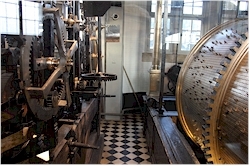 The tower houses a carillon and a giant clock. From the top you have a great view on the historic center of Bruges and the surrounding area. WARNING: there is a possibility to climb the belfry tower but you should be aware that some passages on the stairs are quite narrow. Only a limited number of people is allowed in the tower at the same time. Take into account that there might be a queue.